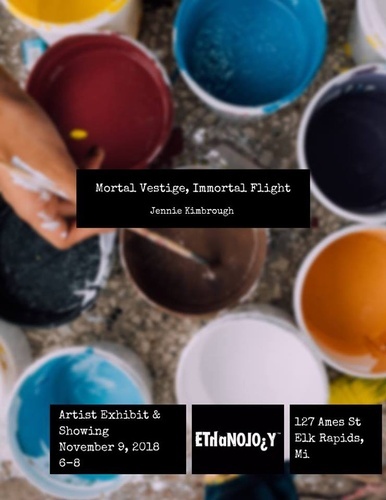 Join us at the distillery November 9, 2018 from 6:00-8:00pm as Jennie Kimbrough will exhibit her Mortal Vestige, Immortal Flight series. We will feature a unique cocktail to celebrate the exhibit, and Jennie will be here to explain each piece in further detail and converse with interested guests. There is a dichotomy to our existence, that of our flesh and that of soul. The nature of man’s flesh is ephemeral; through aging, pain, and death our ultimately impermanent state of being transforms. During our measured years on earth this perishable vessel we inhabit intersects with the everlasting being of our soul. Though our flesh feels pain, emotional anguish, and the certainty of death, the existence of our soul gives rise to the possibility of perfection, spiritual healing, and eternal existence without pain or decay. Jennie began this series of work after being involved in a car accident several years ago. Along with many other long lasting soft tissue injuries, the accident resulted in her suffering chronic migraines. Daily pain has become part of her routine, and a spiritual stumbling block. Pain and suffering is one of the hardest things to understand within the Christian tradition; why is it that we hurt, that we age and die, and how does that fit into the promise of everlasting life that has been given to believers? She began an artistic spiritual journey exploring what it means to live this mortal life, while trying to discover faith in Gods promise of perfection in heaven. Jennie Kimbrough is an artist currently living in Boyne City, MI. She received her B.F.A. in 2004 from Missouri State University, and attended Wichita State University for graduate studies from 2005-2006. Her studio practice focuses on painting, while occasionally venturing into installation work. She works in both acrylic and encaustic with mixed medium elements. She is a member of CIVA. Her work has been featured in solo and group shows in Houston and the surrounding area, as well as Philadelphia, PA, Frederick, MD, Wichita, KS, Springfield, MO, Los Angeles, CA, Austin, TX, along with many other cities across the country.